After seeing Natalie's last show “Mama Drama,” (http://www.womanaroundtown.com/sections/playing-around/mama-drama-sentimental-and-a-must-see-for-young-mothers-in-nyc-2) I was looking forward to seeing her next show. Her latest installment, a tribute to Peggy Lee entitled “I Love Being Here With You,” did not disappoint. This show offered the perfect pairing with the famous Don't Tell Mama, a venue I'd heard raves about for years and wanted to go to but had never had the opportunity to patronize. It's a small but very intimate, cozy setting with a staff whose caring shines through. Don't Tell Mama was definitely a proper setting for this tribute to the gifted, unique and sassy Peggy Lee who I didn't know very much about but who definitely sounds like a woman after my own heart in many ways. From “Mama Drama,” we heard the Disney Princess side of Natalie's voice. In this show, we hear Jazz Natalie. Under the musical direction of Matt Baker (who doubles as the pianist in this musical journey alongside bassist Adam Kabak and drummer Pete Zimmer), we are taken on a journey into the world of one of the most prolific, unique and bold women to ever live in her own time or anyone else's. Peggy Lee was a woman of depth, vision and timelessness. She is the person responsible for Ray Charles, as she gave him the opportunity to share his musical talents with the world while others of her day turned him away due to his drug problems. She also wrote the score to “Lady and the Tramp,” retired at the age of 23 but came back to the music industry after a relentless pursuit by the newly formed Capitol Records and clearly held her own in a world where men typically called the shots. 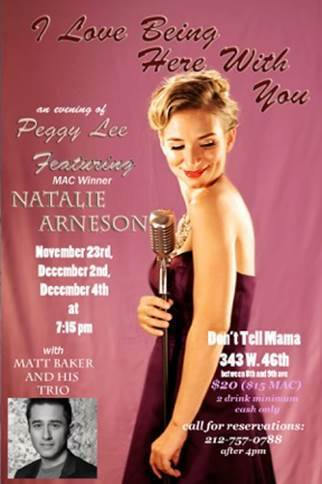 Natalie brings Peggy's catalog to life and demonstrates how timeless Peggy Lee's music and story really are. “My Man,” for instance is the lament of Everywoman, especially the single women of New York City. We have “Fever,” “It's a Good Day,” “He's a Tramp” and countless other musical gems which Natalie delivers with heart along with stories of Peggy's life and times delivered with a comfortable charm and ease. This show reminded me of events I have seen through a friend's musical collective called The Salon, which is responsible for a yearly party called the Liberty Belle Spectacular (among other events). The music was definitely rocking and you just felt like dancing at points. The show is definitely family friendly (as I saw young children here), accurate to the era but also modern at the same time. My guest pointed out some performance shortcomings but these were not things I noticed and regardless of if any exist, this was still a show I enjoyed and would recommend to others.